Should the U.S. stay out of Syria? 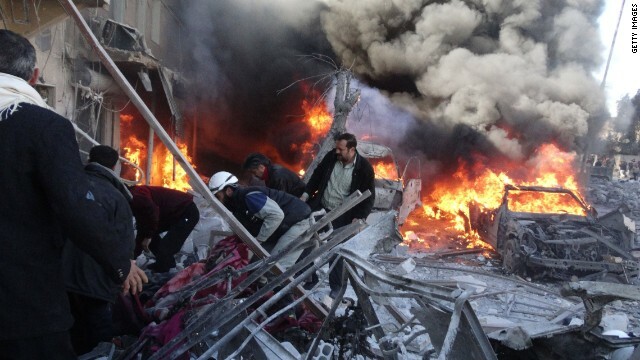 Tonight on Crossfire, conditions worsening in Syria and defiance from its allies. Should President Obama be doing more to help, or should the U.S. stay out of the way? At 6:30pm ET former National Security Council Spokesperson Tommy Vietor and Danielle Pletka, Vice President of Foreign and Defense Policy Studies at AEI, join Van Jones and S.E. Cupp to debate Obama's foreign policy. We want you to weigh in on Today's Fireback question: Should the U.S. get more involved in resolving the Syria conflict? "Staying out" is not actually accurate. Obama has been "in" for some time. He has had the CIA illegally training and arming Syrian rebels in bases in Turkey and Jordan for over two years. Just this year Obama waived a federal statute outlawing the arming of terrorist groups (obviously to avoid any potential legal prosecution). He has threatened a direct military attack (a move fortunately shot down by the AMERICAN PEOPLE). Simply threatening a military attack against a sovereign nation is illegal under international law. Republicans want government to stay out of the way of people so the US government should do just that in the case of Syria. The Syrian government is not directly affecting Americans on US soil so let them work it out. No we should not arm these rebels, because deep down they hate us too. Five years from now, the very same people that we arm now, will probably be using those arms against us , against our allies or arming terrorists to help them to commit their cowardly crimes. There is no reason that our American men and women should be sent over there to risk their lives for another totally messed up country in this never ending region of stupidity and violence. The US should not send troops into any nation having internal distress. We shouldn't invade anyone either. "Boots on the ground" should be limited to situations where we are protecting ourselves or defending another nation from an agressor... the first Iraq war being an example. What we can do is other forms of assistance... from providing arms and logistical support to creating no-fly zones like we did in Libya. But once you put boots on the ground... you now own the process of putting that country back together again. We own the fixing of Iraq and Afghanistan for that reason... and we don't own the fixing of Libya. Our army is great at winning conflicts. Our military is excellent at blowing things up and killing our enemies. But they aren't very good at nation building or being police. Our military involvement needs to be the former. Libya is the model. If we need to bomb the heck out of Syria and create a no-fly zone... then we can do that. But no invasion. Syria needs to rebuild itself... we cannot be tied down to another rebuilding project. Another Libya is okay. Another Iraq is not. This is a shame, but I'm really sick of us spending so much of our money, time and resources in these totally messed up Middle East countries. We really need to start increasing the safe harvesting, production and distribution of our own natural energy here in the USA, rather than paying for fuel from countries where they hate us. Let’s keep that money and those jobs here in the US. Let's start bringing more of our troops home and start using them to protect our country from the incursion of illegal aliens here at home. I agree that there is an issue in the United States regarding intervention in foreign arenas. We are however an extremely powerful military force that I feel have an obligation to intervene were human rights violations occur. If we don't stop this conflict or at least have a say in the creation of the following government, then Syria will become a breeding ground for the next generation of terrorists which will have direct ramifications on the United States. This issue does not die when the civil war ends. The other issue that I have is with the manner in which the situation was handled by the president. If we are not going to become involved then that needs to be our stance. No uncertainty may exist in our foreign policy on this issue. A red line was drawn and crossed, yet the current administration failed to respond in the manner initially set fourth. The alternative solution was better than no action but the problem still remains. The United States is now obligated to intervene more forcefully seeing as to the fact that our prior actions have not ended the violence. If boots on the ground are necessary so be it. The sacrifice now will benefit the nation in the long run. I find it incredibly annoying how Van Jones always gets to make social commentary of a liberal nature and there is never any response allowed from the Conservative person. It is typical liberal establishment bias by omition of the dissenting opinion. It is too late to affect any change in Syria, that opportunity has passed. The objective should be containment and isolation of Assad and terrorism, the current admin has botched any realistic attempt by the west to affect the outcome short of military boots on the ground. why that make happy? why killing my brother and his family by Sauudi thugs make you happy? why everybody like parrot repeating the same melody? nobody has different opinion?? remember 9/11 and who did it?? There was never any opportunity to affect any change (for the better) in Syria. One only has to look at Afghanistan, Iraq, et al. to realize that. Both sides are are bad. Let them decide which one is worse. An invalid question. As per General Ramsey Clarkes revelations and leaked Stratfor documents, US has been neck deep from planning, economic warfare via sanctions, infiltration of armed insurrection, training, arming and supporting their proxy forces of local and invading Wahhabi terrorists since inception of the Syrian UNcivil war. The question should be : SHOUL US RESTORE RULE OF INTERNATIONAL LAW? – Freeze funds and sanction those allies funding terrorism. ie. Mainly Qatar and Saudi. – Prosecute those who are aiding and abetting al Queda branches of terrorism. ie. US-France-UK & regional stooges Saudi-Qatar-Turkey-Jordan-Israel. – Conduct itself with integrity and allow DEMOCRACY to prevail in Syria, instead of the farcical 'peace talks' designe to install a puppet whose convicted felon background as a drug runner, brothel keeper and hired assassin is well known. Mr. Kerry If the government put 1/10th the resources dedicated to confronting dividing, overthrowing and reconstructing other governments into fixing our own; maybe things wouldn't have gotten this bad. I am appalled. I love my country, but utterly ashamed of my government. HELL NO we won't go!